Recently, several articles were brought out highlighting the loss of 41 tigers from India’s forests over the first 7 months of 2015. A variety of causes were responsible for these deaths, ranging from infighting, to poisoning and killing for skin and bones by professional poachers. However, what does this say about the efficacy of India’s tiger conservation programme? Wildlife scientists have always held that tiger populations experience high turnovers-they are prolific breeders, but also die young. This may be borne out by the reasonably high number of annual tiger deaths recorded over the past few years-61(2014), 76(2013), 89(2012), 56(2011) and 53(2010). Intensive monitoring of tiger populations actually tells us that the recorded death figures are actually a fraction of the total number of deaths. If populations are adequately from adverse factors such as habitat loss, poaching and conflict, then the naturally high rate of reproduction will ensure that tiger populations continue to thrive. Which is what brings us to the next question- how indicative are these deaths of the effects human-induced adversities on tiger populations ? The likely answer is- that they present a highly incomplete picture. For instance, only 3 seizures of tiger parts have been made from poachers this year; the figure was 12 in 2014. However, independent investigations indicate that only a small percentage of seizures come to light. 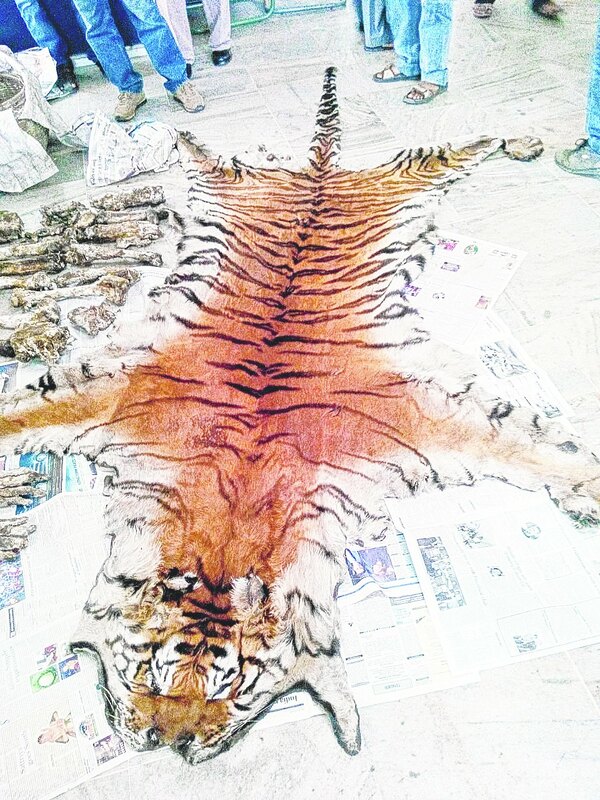 A tiger skin being seized from poachers.
. Official investigations into such deaths are also marked by a lack of transparency. Officials are usually very keen to make it look like as if every instance of tiger death is a result of natural causes, which often causes many instances of tiger poisoning to be swept under the carpet. Many carcasses are recovered in an advanced state of decomposition; which, coupled with a shortage of adequately trained vets, means that the actual causes of death are determined in only a very small number of cases. Details of investigations into tiger deaths are still awaited in as many as 33 of the aforementioned 41 cases. 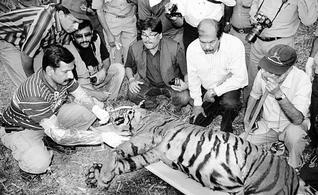 An investigation into a tiger death in progress in Mudumalai Tiger Reserve. Wild tigers continue to be threatened by innumerable factors ; but tiger death statistics alone cant quantify these threats. Where benign insects control harmful pests. Much of the destruction that we see on the farm is the result of unwanted and exorbitantly expensive chemical inputs. Take the case of chemical pesticides. It was in late 1970s that David Pimental of the Cornell University had said in his landmark paper that 99.9 per cent chemical pesticides go into environment and only 0.01 per cent of the pesticides sprayed reach the target pest. Despite this warning, agricultural scientists continued to advocate the use of chemical pesticides. While the industry gained immensely, farmers as well as the gullible consumers suffered. This makes me wonder whether there is a way out. Can the Indian farmer ever emerge out of the chakravyuah? .....Last week, I visited Nidana and Lalit Khera, two tiny and nondescript villages in Jind ditrict of Haryana. Farmers and village women in these villages have gone a step ahead. Not only they don't spray chemical pesticides on cotton, they don't even use bio-pesticides. They have allowed the insect equilibrium to prevail to such an extent that the harmful insects are taken care of by the beneficial insects. Meena Malik is a 23 year-old graduate, who along with some 30 women of the nearby villages, partakes in a mahila keet pathshala (women insect school) every week. Once in a week, they spread across cotton fields in small groups early in the morning, each carrying a magnifying glass and with a notebook in hand. They identify the beneficial insects, which are mostly non-vegetarian, and count its population on a few plants. 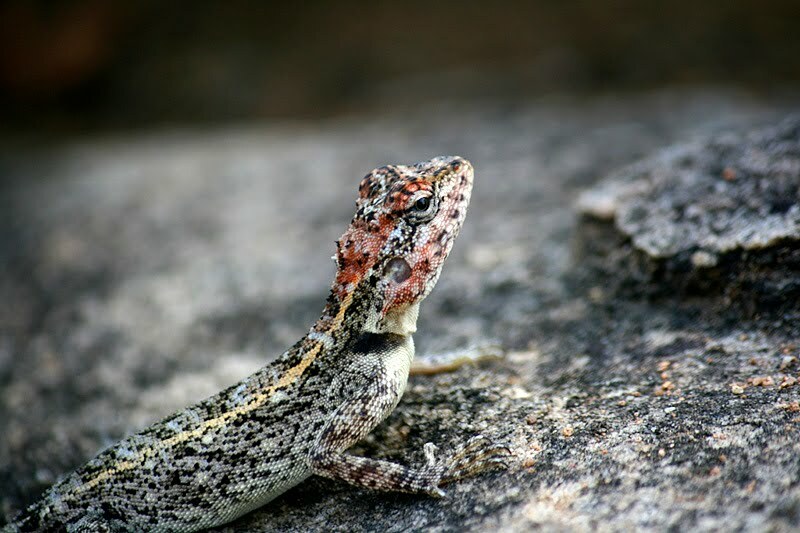 Similarly, they look for the harmful insects, mostly vegetarian feeding on the plant foliage and fruits, and based on their observations make a note of the insect diversity that exists in the crop fields. The monsoon rain started during November, 2014 – the initial rains were good. When the rain poured non-stop for a fortnight destroyed vegetable cultivation. So it happened to the kitchen garden of my neighbor too. The entire kitchen garden with Amaranthus, Okra, cluster beans, beans and gourds could not withstand the water stagnation. The papaya tree laden with fifty big papayas and fifty small papayas could no more stand straight. The tree fall with the fruit bearing tip broken. They were about to severe the entire tree, I happen to watch it over from my windows and stopped it. I immediately rushed to the plant and asked to find supportive poles and make the papaya plant straight as much as possible. February 2015 gave me a surprise with three tine buds from the node little lower than the broken edge of the papaya tree. I was so excited and felt very much encouraged, as the tree spoke me to EXCEL THE PAIN. It became a non-voluntary action to see the plant every day in the morning. In the month of April, buds turned into branches but there were heavy infestations of Papaya Mealybug (Paracoccus marginatus). I asked them to remove the infected leaves often. They turned frustrated asking me is the bug coming to your house. Then I explained about the mealybug and could be controlled by manual removal of the leaves, luckily there were no infestation of the bug in any of the other plants nearby. Now during July, I was amazed to see the papaya tree with three branches, all the three loaded with papayas big and small. What made me wonder is, “the plant which could not bear the load of a single plant is now capable of its triple bearing – from many nodes there are two, three or five papayas”. What a lesson the MIRACLE papaya tree taught me - ENDURE THE PAIN, WORK HARD and BE SINCERE, withstand all the odd situations and one day surprising results turn all the agony into glee. 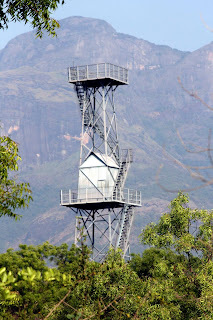 I have visited the Chinnar WLS few times over the years and never had the opportunity of spending a night in the wilderness of the beautiful place.The idea of visitng Chinnar and staying for a night came up again in this May(2010), and we packed our bags and headed towards Munnar on a fine morning. Chinnar is one of the 12 WLS that Kerala is proud of and is adjoined by Eravikulam Natonal park,Anaimali WLS and Kodaikkanal WLS.The highest peak of Kerala,The Anaimudi is just 23kms away from Chinnar. We reached Munnar around 8pm and stayed for the night there.The climate was pleasant and we felt really good and at least for a few days escaping the gruelling heat down the plains. The next day, our idea was to visit Eravikulam National Park and then proceed to Chinnar.But the tourist inflow was very high and we saw quite a number of them lining up to get to Eravikulam NP.We decided to skip the Nilgiri Tahrs for this vist and headed immediately towards Chinnar. 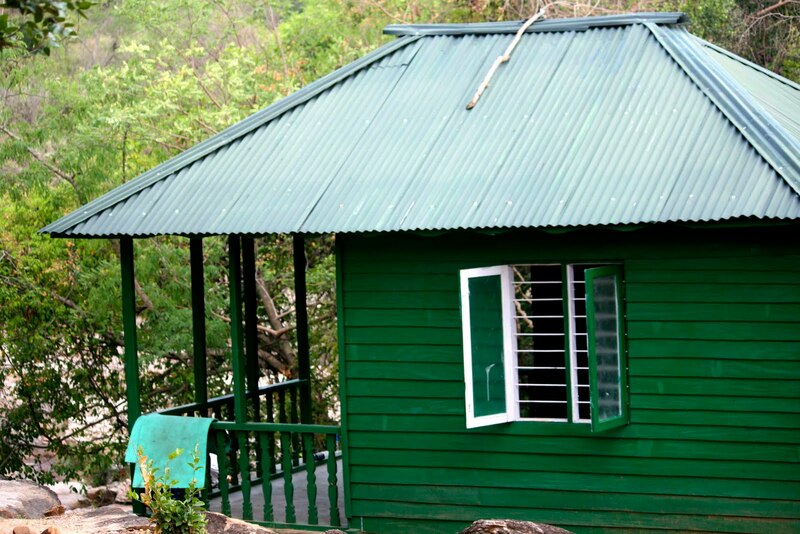 We have planned to stay at one of the Loghouses that Chinnar offers.We havn't planned which particular loghouse.Any one of them would do for us.All are inside the Chinar sanctuary. We meandered our way towards Maraiyur(which is around 40kms from Munnar).Both sides were filled with tea plantations and we stopped at a few places to take some pictures.We reached Maraiyur and without stopping headed towards Chinnar which is a further 18 kms away. 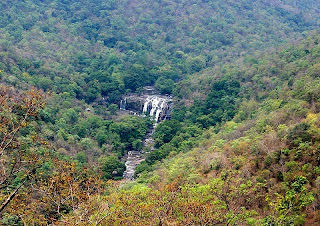 We stopped on way to view the Thoomanam waterfalls which was cascading with all its splendour.I clicked a few photos with my Canon 400D and 55-250 IS lens. 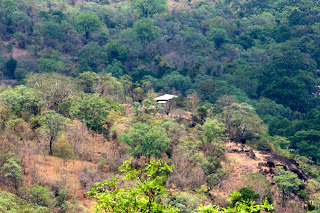 From the tourist info center we came to know about the loghouse near the falls.But we have already made up our mind to be at Chinnar proper. We finally reached Chinnar checkpost around 2pm.A quick vegetarian lunch at the hotel run by tribals satisfied our hunger.We booked the loghouse and waited for the Tribal forest guard to come and lead us to the loghouse. Mr.Kannan ariived at around 3pm and we immediately started our trek rowards the Loghouse.We kept only a few pieces of cloth and rest of the baggage remained in the car which we parked near the Checkpost. and very less number of photographs exists of the animal.The largest population of Mugger Crocodiles are living in Chinnar sanctuary. 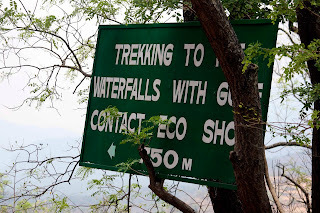 We started our 3km trek to the loghouse in right earnest.The heat here is unbearable.Chinnar is the "Rain shadow" region of the Western Ghats.Rain shadow region is where the rainfall is minimal.The temparature can raise upto 38degree celcius at times! I was expecting to sight elephants on the way to the loghouse and Kannann also gave me assuarance.We passed the watch tower(Didnt bother to climb as it was early afternoon) and continued to walk towards our destination.Yellow throated bulbul is one of the 245 or so species of birds that can be seen here. 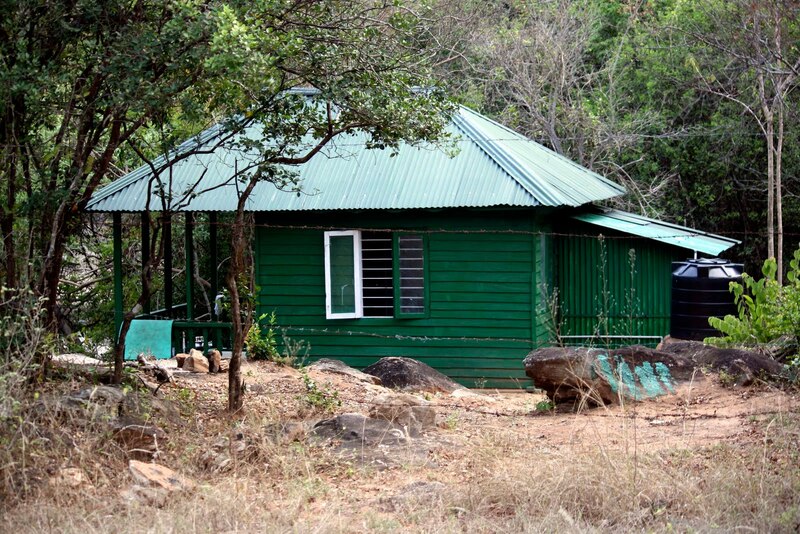 In around 45 minutes we reached our loghouse which was built near the Pambar river bank.Chinnar is the other river and it becomes the Amaravathy river as it reaches Tamil Nadu. The log house is built with logs(of course) and thatched with asbestos sheets.The time was around 4:30pm and the heat was still on the higher side.Kannan informed us that the temperature will be cooler during night. After sitting in the loghouse for some time I headed to the river.I could see plenty of rock Agamas playing around.I photographed the agamas to my satisfaction and in between dipped myself in the Pambar river. A few babblers were rustling at a distance and the sound of birds reinvigorated our souls.Since my lens can reach only up to 250 mm I decided against attempting to photograph them. At around 7:30 pm another guard arrived with our dinner.It was simple Parothas and vegetable curry.We can't complain about the food when you are in deep forst! The log house is comfortabel for 2 people.The guards said they would be comfortable sleeping on a rock face very close to the river.I saw some people moving in the opposite bank of the river.Kannan informed us that they are Tribals from Tamil Nadu laying nets for catching fish. We had a good nights sleep in the middle of the Chinnar foest.That is what I have been dreaming for over a number of years.Now it has been fulfilled.Just before we retired to the bed I heared Kannn calling me from outside.On opening the door I saw a Star Tortoise baby crawling towards the door.Immediately I took some pictres using flash. We got up early the next morning and went and sat near the river.It was a beautiful feeling to sit there just listening to the flow of water and chirping of birds.Far away from the hustle and bustle of city life. 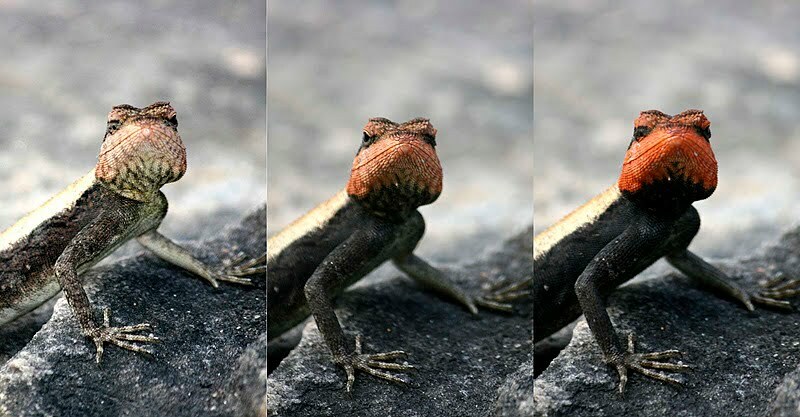 Amazing......A rock Agama changing colors.This happened in 10seconds! 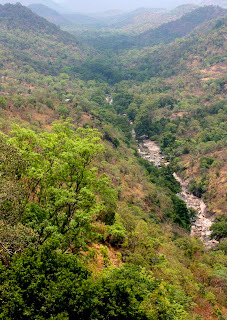 We started our trek back to the check post around 8am.I was very optimistic about the sighting of an elephant herd on our way back. We coudn't see any elephants but foot marks were aplenty.Kannan pointed out a particular set of foot prints which was of a tusker. We reached the check post around 9am.We thanked Kannan for the way he has taken care of us and asuured him that we would be back agian for a stay.After having breakfast at the tribal hotel we started our journey back. 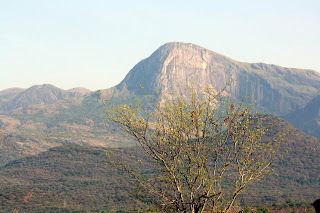 Chinnar........Get lost in this place!!!! The beautiful appleorchards in Himachal Pradesh are a popular travel attraction of the state.While in HP a visit to these beautiful apple gardens is a must as here you canget to know more about the cultivation process along with enjoying thepanoramic view of the Himalayan ranges at the backdrop. Shimla isimportant for apple cultivation. This picture is of the hill slopes of Theogwhere apple cultivation is the most important activity. Also you can buy lotson apples from these orchards on your way back. Apple is one of the mostimportant commercial crops of the Himalayan region and Himachal Pradesh (HP) with 1.05 lakh ha area under apple cultivationwhich fetches livelihood for more than two lakh farmers. The wintertemperature and precipitation in the form of snow are rtant and sensitive climatic factors for induction of dormancy, bud break and also to ensure proper flowering in apples. Ever imagined a tiger so bold to eat his prey in the middle of a busy highway. That’s "T24" or the "Ustad" apparently, been spotted on the highway more than once. During our 3-day stay, in Ranthambore and on one of our visit's to the park, we heard calls just near the park's entry gate. We could see few people climbing nearby rooftops of the buildings and houses to have a peep into what was actually going around. oops!!! It was T24 our own very dear Ustad. It is believed that T24 had some problem in his legs around 18 months back. A splinter of wood was the trouble shooter for him. 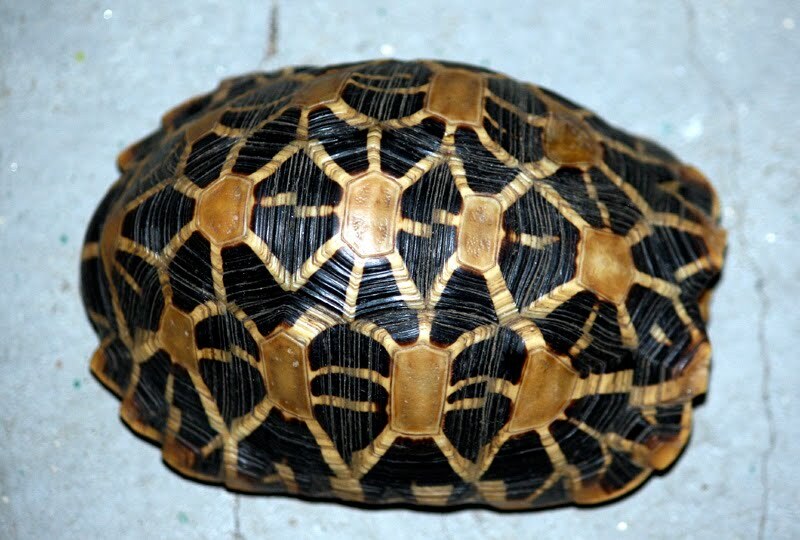 So, the forest officials took him away to remove the splinter and treat him further. This took about 1-2 days and during this period, T24 had enough time to be around humans leading him to be completely fearless of the presence of humans around him. And since then, he has been responsible for creating the fear of God in man. From the main gate of the National Park, there is a public road that goes till the Ranthambore fort and many people use it regularly to offer prayers to the famous Ganesh mandir inside the fort. This road falls within tiger territory and on many evenings, tigers can be spotted. Now this road comes under the territory of T24 and another female tiger as well. A male will have a larger territory overlapping a few female tigers. Now since that T24 has killed around 4 people it is being given a thought of it being a man eater. But many experts still believe that tigers don't become man eaters till the former is unable to hunt due to some physical ailment or its territory is being trespassed time and again. In the case of T24 the reasons quite obvious have been the latter where fear of the presence of human beings around him has vanished completely. However mighty the human may think he is, but the side is always flipped when it comes to the ruler of the jungle. Conservationist Ananda Kumar, who created an SMS warning system to help workers live safely among elephants wins global recognition. “It’s very difficult to make out elephants in the dark. It’s a huge animal and looks like a rock and will be standing very still when they notice people.” On the Valparai, high in India’s Western Ghats, tea and coffee companies have flattened 221 sq km of prime rainforest for their plantations. The cleared land is now home to 70,000 workers, who live surrounded on all sides by the rugged, deeply forested Anamalai (Tamil for ‘elephant hills’). “Elephants are strongly related to their ranges, this is scientifically established. 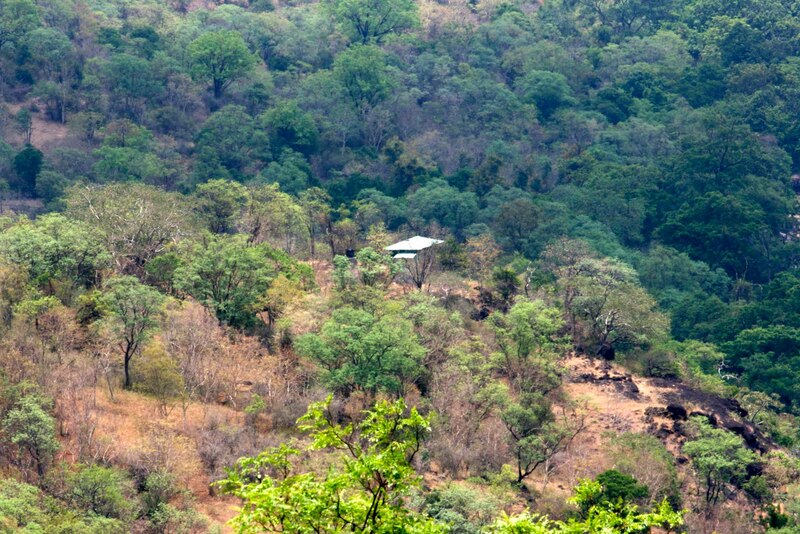 It’s a part of their home, which is lost to plantations because of historical exploitation,” said Kumar, who has spent a decade working on a system of text messages, television alerts and warning lights that keep track of elephants. The programme won the Whitley award for its novel and pragmatic approach to the elephant-human conflict, which kills 400 people and more than 100 elephants across India every year. I visited Mayureshwar wildlife park in the month of April. Its a well kept secrete. The main attraction of this sanctuary is Indian Gazelle ( Chinkara ) . 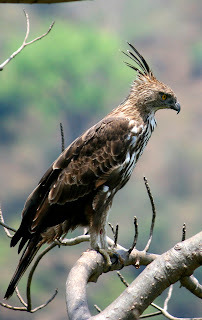 But there are also some rare bird found here like Indian thick Knee and Teetar.